Protects 1.125’’ diameter wires and cables. Dual 1.125’’ x 1.125’’ cable channels. Has a 2’’ channel gaps for cable cross-over. 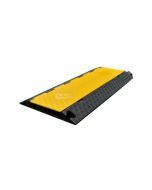 Our great product the 2 channel cable protectors protects up to 2 cables, hoses, or wires from damage caused by heavy vehicle and industrial traffic. 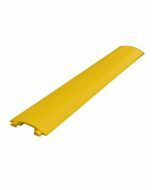 This cable protector has 2 channels that can accommodate cords, wires and cables measuring 1.125″ diameter and protects them from being damaged by forklifts and other vehicles weighing up to 12,000 lbs per axle, this cable cover comes with a very resistant and durable PVC flap. 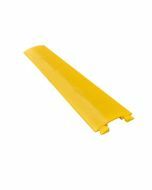 They are very easy to manage, comes with an excellent bright yellow safety lid that increases safety with 28° incline smooth approach angle. They are durable with 5 years guarantee.